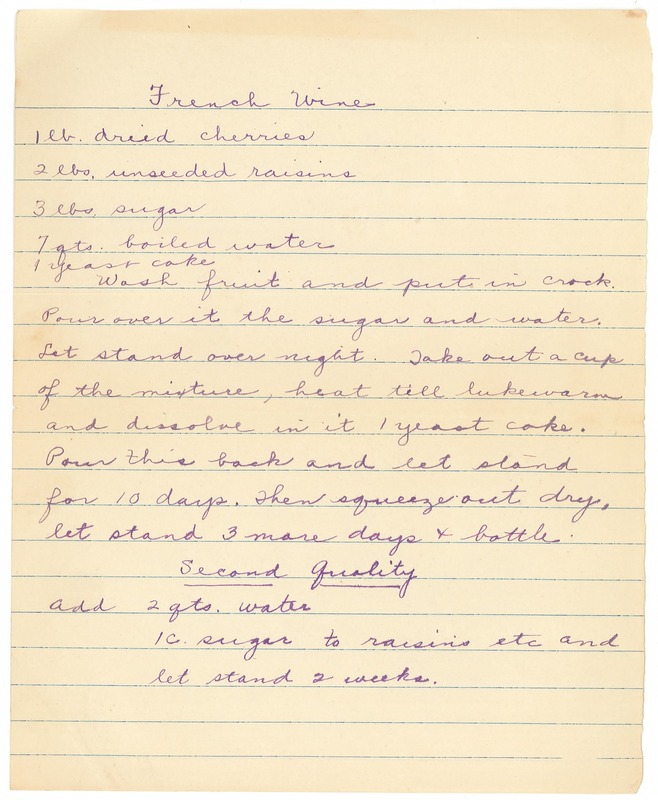 French Wine 1 lb. dried cherries 2 lbs. unseeded raisins 3 lbs. sugar 7 qts boiled water 1 yeast cake Wash fruit and put in crock. Pour over it the sugar and water. Let stand over night. Take out a cup of the mixture, heat till lukewarm and dissolve in it 1 yeast cake. Pour this back and let stand for 10 days. Then squeeze out dry, let stand 3 more days & bottle. [[underlined]] Second Quality [[/underlined]] add 2 qts. water 1 c. sugar to raisins etc and let stand 2 weeks.